Wednesday January 16th 1901 It turned very cold in the night. Will went to haul hogs for the neighbors. Mort was busy about home. I did a little sewing. Thursday January 17th 1901 I was busy all forenoon doing baking and getting dinner. Henry with a boy came down for dinner they were getting things of his here as he has sold the farm. I was over to Mrs Henleys in the afternoon Friday January 18th 1901 The boys took an early start with loads for the farm I put in the day sewing. Henrys boy was here for dinner. I had a letter from Mother she is not well. A cold winter day. 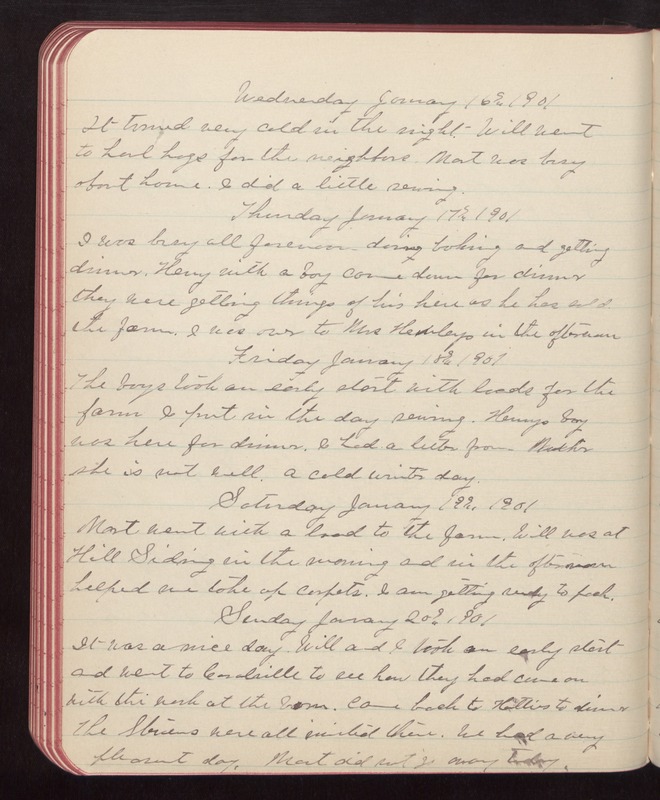 Saturday January 19th 1901 Mort went with a load to the farm. Will was at Hill Siding in the morning and in the afternoon helped me take up carpets. I am getting ready to pack. Sunday January 20th 1901 It was a nice day. Will and I took an early start and went to Coralville to see how they had come on with the work at the barn. Came back to Hatties to dinner the Stevens were all invited there. We had a very pleasant day. Mort did not go away today.